Soon it will be time to eat all my meals outside (when possible), curse the wind because it keeps blowing my skirt up and I’m not wearing thermal leggings because it isn’t -40 degrees outside, and bust out the SPF 50. I don’t tan. I just turn into a tomato. SPF is so necessary. And while I’m waxing euphoric about the most glorious day we’ve seen since September, I also realize that this glory isn’t quite here to say just yet. So, we shall drown that thought in cake, my friends. 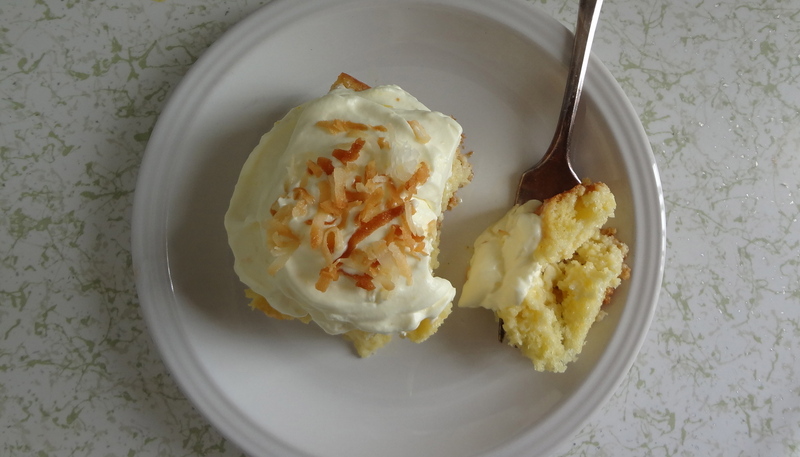 Cake that tastes like a pina colada. Remember all that lemon curd I made last week? Well I had to do something with it. And I had some heavy cream, so, you know…lemon whipped cream? And I had to put it on something, of course. You don’t just eat lemon whipped cream. It’s very much like If You Give a Mouse a Cookie. 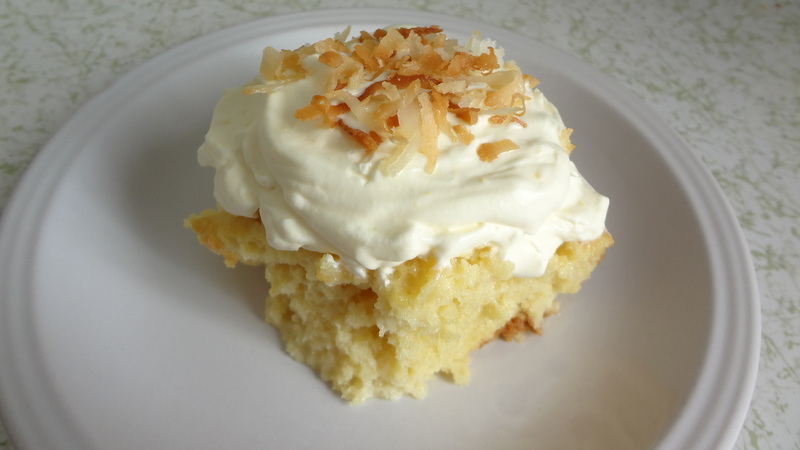 So, the coconut tres leches cake with lemon cream was born. And it is spring in a dish, let me tell you. It’s so light, but has such an amazing texture – not overly soggy. And it was a breeze to make thanks to a little box of cake mix and my trusty blender. 1. Bake your cake according to the package instructions. Let it cool completely before you start to assemble your cake. 2. In the meantime, beat the whipped cream on high until stiff peaks form. Add the lemon curd, and beat until combined. 3. Pour the coconut milk, evaporated milk, and sweetened condensed milk in a blender. Add the vanilla extract, and blend until completely combined. 4. Once your cake is cooled, poke a million tiny holes all the way through the cake with toothpicks or a fork. I found the toothpicks worked better, they didn’t stick to the cake as much. The more holes you poke, the more liquid your cake will soak up. 5. Pour the milk mixture all over the cake. You won’t use it all, I used about half, so save the rest for something tasty we’ll make later. You want to keep adding milk in small batches until the cake stops soaking it up. 7. 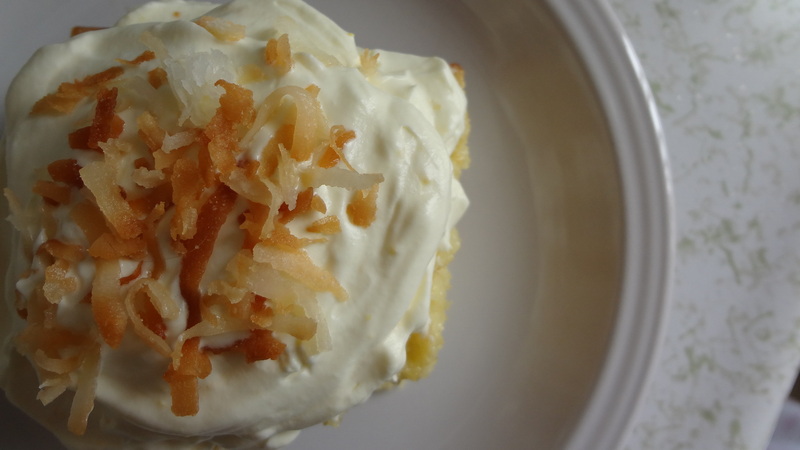 Top your milky cake with the whipped cream, then sprinkle with the cooled toasted coconut. Refrigerate until served, and then use a spatula, the cake will come apart pretty easily. This entry was posted in Uncategorized and tagged Baking, coconut cake, coconut tres leches cake, coconut tres leches cake with lemon cream, Desserts, Easter desserts, how to make tres leches cake, lemon curd, lemon curd cake, lemon whipped cream, spring desserts, tres leches cake by theculinarycapers. Bookmark the permalink.